Info Congressman George Miller (D-CA), a leading spokesman in Congress on education and labor, the environment and Native Americans, has represented the 7th District of California in San Francisco's East Bay since 1975. His district includes portions of Contra Costa and Solano counties, including Richmond, Concord, Martinez, Pittsburg, Vallejo and Benicia. In January, 2001, Miller was elected by the Democratic Caucus to serve as the ranking Democrat on the House Education and the Workforce Committee, a committee on which he has served since he first came to Congress. He also serves on the House Resources Committee, formerly known as the Natural Resources Committee, where he was chairman from 1991 to 1994 and ranking Democrat from 1995 to 2000. 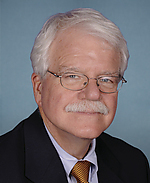 Prior to chairing the Resources Committee, Mr. Miller was the founding chairman of the House Select Committee on Children, Youth and Families from 1983 through 1991, where he led congressional efforts to stop President Reagans budget cuts against child care, education, workplace safety, health care, nutrition, Native American children, housing, and family planning. Through the Select Committees efforts, congress began to embrace the importance of investments in early childhood development programs to improve their health, education and well being and to avoid greater long-term taxpayer costs. Perhaps his most important legislative achievement since being elected in 1975, Miller was one of four key authors of a historic education reform bill passed by Congress in December, 2001, and signed into law by President Bush on January 8 of this year. H.R. 1, or the Leave No Child Behind Act, is the most important reform of federal education laws in 30 years: providing unprecedented targeting of federal resources on the neediest students and schools; holding schools, students and teachers accountable for educational improvements for all students; and, providing the resources for teacher training and development that are necessary to achieve a qualified teacher in every classroom within four years. One of Millers top priorities this year will be to continue his advocacy to improve the quality of public schools, including fighting for a federal budget that meets the requirements laid out in H.R. 1 and also seeking funding to help repair and rebuild dilapidated public school facilities. Another top priority for Miller this year is to protect the retirement savings of average employees in light of the collapse of the Enron Corporation and other large corporate bankruptcy filings. Miller has introduced legislation, H.R. 3657, to allow employees to sell company stock in their 401(k) plans after only one year in the plan and to require an equal representation for employees on their companies pension boards to ensure their interests are adequately represented. In addition to H.R. 1, George Miller has a long list of legislative achievements, including a historic expansion in 2000 of federal support for land conservation, wildlife, and coastal protection, the 1992 California water reform (CVPIA), the California Desert Protection Act of 1994; timber reform; foster care and adoption reforms; child care; the Women, Infants and Children (WIC) nutrition program; aid to victims of family violence; children's mental health care; and, several education reforms. Miller was a leading critic of U.S. policy in Central America throughout the 1980s and early 1990s. He led the congressional investigation into the Exxon Valdez Alaska oil spill and authored major portions of the 1990 oil spill liability law and sections of the Energy Policy Act of 1992. He has led congressional efforts to bring Chilean Gen. Augusto Pinochet to justice. Miller supports increasing the minimum wage, ending the use of sweatshop labor, improving workplace safety, modernizing worker retraining programs, and reducing global warming through emission curbs, energy efficiency and alternative energy. Miller has long fought to protect the rights and well-being of Native Americans, believing the U.S. must honor the rights of Indian nations. He has sponsored and fought to enact legislation to increase funding to tribes, expand Indians educational and economic opportunities, protect gaming rights, promote dam safety, strengthen tribal courts and law enforcement and expand self-governance. George Miller was born in Richmond, California, on May 15, 1945 and lives in Martinez. He graduated from Diablo Valley Community College, San Francisco State University, and earned his law degree from the University of California, Davis, Law School. He served on the staff of then-State Senate Majority Leader George Moscone in Sacramento. He is married to Cynthia Caccavo Miller, a life-long resident of Contra Costa County. They have two sons, George and Stephen, and three grandchildren.